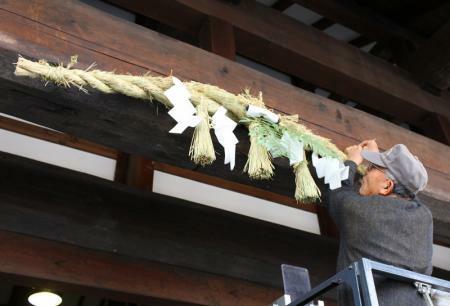 Today is December 28th, this year has only four days. 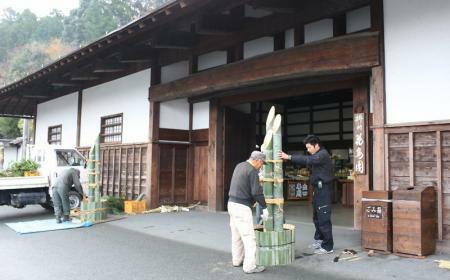 I see Nagayamon Entrance under general cleaning to prepare for coming year. 12월28일 이제 나흘만 지나면 새해를 맞이하게 됩니다.새해를 맞이하면서 당원에서도 나가야의 청소를 하였습니다. The huge entrance of the Garden imitates the Nagayamon Entrance of Kamo Garden, the sister garden of Kakegawa Kachoen. The entrance is designed wide with high eaves to prevent visitors on a large bus on rainy days from getting wet. 당원입구의 대문은 자매원 카모꽃창포원의 나가야문을 모방하여 문앞에 멈춘 뻐스에서 내린 손님이 비에 젖지 않도록 지붕의 폭을 넓게 만들었습니다. 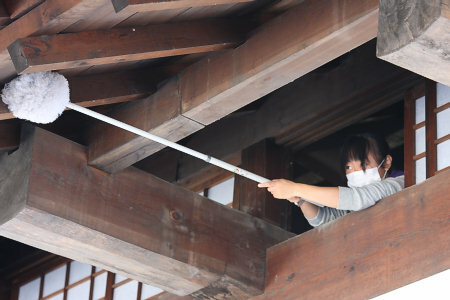 After majority of the dust is swept with long bamboo brooms, the rest is fixed up with smaller brooms that staff member stick out of the small windows on the first floor. 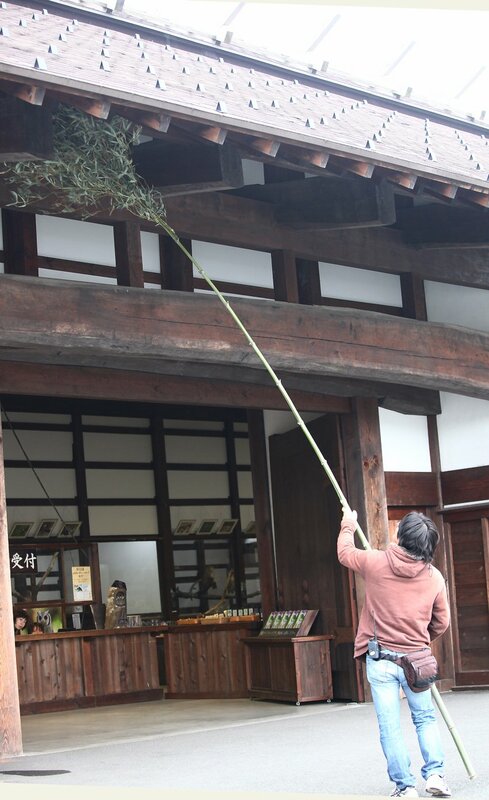 In this picture, Ms. Ozawa is cleaning the entrance. 대나무로 청소하지 못한 먼지는 나가야문 2층의 창문으로 작은 도구를 이용하여 먼지청소를 합니다.마침 새스탭 오자와씨가 먼지털이를 하고 있었습니다. After the cleaning, a couple of large Kadomatsu decorations are assembled in front of the entrance, with bamboo canes that were collected from a hill behind the Kamo Garden. 모든 청소가 끝난 후 문앞에 놓는 카도마쯔를 만들기 시작했습니다.카모꽃창포원의 산에서 구해온 대나무로 큰 카도마쯔를 만듭니다. Huge Shimenawa decoration, that was made of rice straw collected from ricefields around the Kamo Garden, is hung on the entrance. 카모꽃창포원부근의 논의 벼로 만든 커나란 시메카자리도 있습니다. 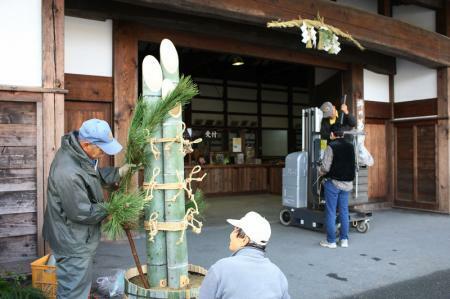 Shimenawa decorations are finished with branches of pine, Sasa veitchii, Nandina and Japanese Plum added.